Cut off the leaves, bag them separately and refrigerate the leaves for use within a few days. Refrigerate the roots unwashed in a plastic bag. They should keep for anywhere from 4 week to 6 weeks in the fridge. Turnips are a good source of Vitamin B6, Calcium, Phosphorus and Manganese, and a very good source of Dietary Fiber, Vitamin C and Potassium. 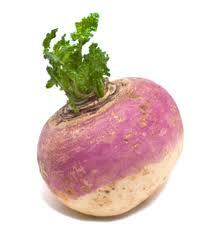 Turnip was massively consumed in Germany during the WWI when meat and potato became scarce. Flour made of turnip was used for the preparation of bread. Winter period of 1916-1917 became known as "turnip winter." Substances isolated from turnip can prevent development of certain types of cancer, cardiovascular and ocular disorders.